This year I am bringing you a video which explains the International Day of Happiness. Happiness is for each of us. Let’s take even the smallest action today, like a blog post, time for fun, extra hugs, or any act of kindness to encourage everyone with ways to be happy and positive. Being negative or neutral doesn’t take much effort, unfortunately. Being positive and happy takes effort and time. Remember to take time for yourself to focus on the things that help you to be happy, you deserve it! Please take a minute to watch this video to be inspired by people around our beautiful world. Visit http://www.globalgoals.org/worldslargestlesson To join UNICEF and Team Smurfs to make the world a happier place visit http://www.SmallSmurfsBigGoals.com and celebrate World Happiness Day with the United Nations and Team Smurfs on March 20th. I hope this made your day happier! 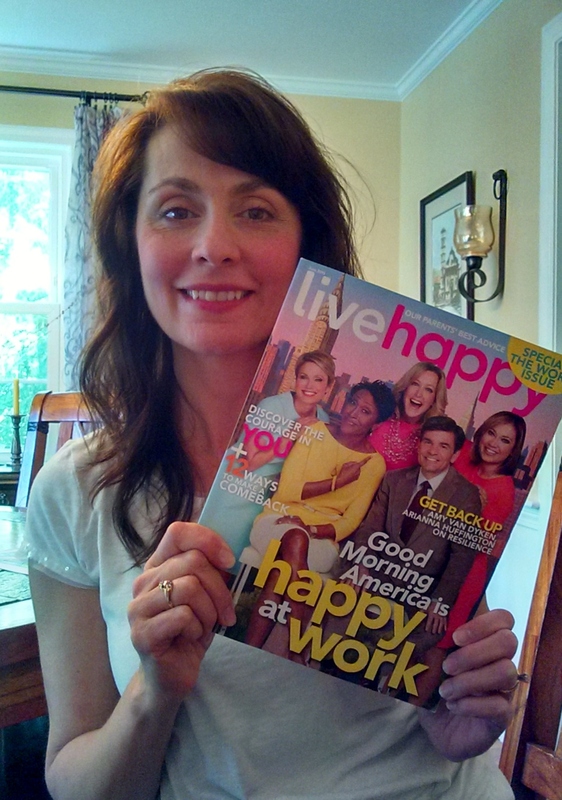 Thank you for reading “My Happy”! A Happiness Project taught in a classroom in France brings happiness to a classroom in Spain and to me! Two students taking “The Science of Happiness” course given by the University of California Berkeley were unaware that their paths would happily cross and be mutually beneficial. My new friend, Madame Corinne, a caring teacher in France to six and seven year old creative students and I connected when Madame Corinne did a Google search and found “My Happy”. Madame Corinne was kind enough to leave a comment sharing that she was a teacher in France. After reading her comment I was eager to ask Madame Corinne if she would like a copy of That Makes Me Happy! I noticed that her e-mail address came up with her comment on the “My Happy” comment page. I thought about sending her an e-mail, then decided not to. Yes, self-doubt held me back. In the past I would have simply given in to my self-doubt. Instead, I reminded myself how far I had come since my first blog post. I felt good about the writing, the volunteering, and the learning. One question I now ask myself when I am presented with an opportunity is: “Why not?” I again found myself looking at Madame Corinne’s e-mail address. This time I e-mailed her. I asked if she would like a copy of my story to read to her class. Madame Corinne was so kind to say yes! She was already planning a wonderful Happiness Project for her new class and the story fit right in. Madame Corinne began her new school year by focusing her students on happiness. I was very honored that she read “That Makes Me Happy” and had her students make Happy Rings as part of her project. Madame Corinne asked her students to think of “3 small happinesses” each morning. Students created pictures and posted their drawings to a bulletin board. Below are the pictures Madame Corinne shared with me. Her students were very creative with the Happy Rings. I especially liked how they personalized them, even the smiley faces! Happy Ring total has now reached 127! I also enjoyed looking at all the pictures on the bulletin board. Madame Corinne shared her project with a teacher in Spain. Senorita Berta will be teaching her students this happiness project and all the students from each classroom will share their ideas this year! How wonderful! I was excited I had written that e-mail and in a small way I was apart of these terrific projects. I am still amazed at how simply reaching out has connected me to fellow happiness creators so far from my home. Creating happiness is making a difference to Madame Corinne, Senorita Berta, and their students this year. Madame Corinne’s Happiness Project not only teaches students they can create their happiness, it also teaches students even though we may be living in different countries, we CAN connect, and we CAN make a POSITIVE difference. Everyone’s ideas are important and we can be happier by sharing them! 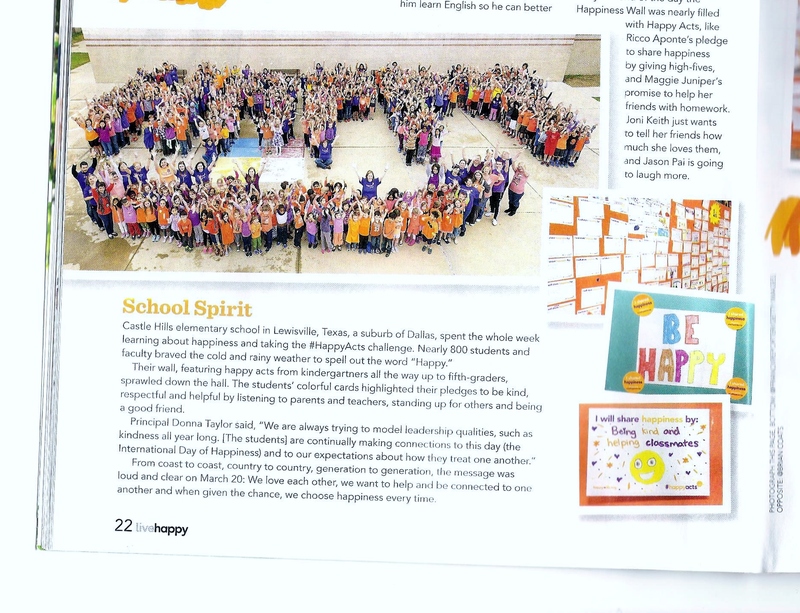 Thank you Madame Corinne and Senorita Berta for teaching your students about creating happiness! Thank you for sharing my story. Please thank your students for making Happy Rings! Please share your experiences if you purchase the book and read it with your children or students. I would greatly appreciate feedback! I recently watched a speaker explain that sometimes we don’t follow through with ideas because they seem too “easy”. That is how I feel about my blog. I am simply a messenger posting what is all around us. It is my way of doing the work for my readers by organizing important information which can improve lives. This is my fun, learning and growth. I have been posting about ways to feel happier (according to the latest research) and retweeting real life examples of the information I share. I would like my readers to find the information easy to understand and use in their lives, because that’s what it’s all about, isn’t it? The following video explains the difference between having a fixed mindset or a growth mindset. Carol Dweck (Stanford University psychologist), Christine Carter (sociologist, happiness expert, author) and Kelly Corrigan (author, speaker) discuss mindset and motivation. This video, 5 Keys to Social-Emotional Learning Success, was shared from Edutopia’s YouTube channel. I thought this video would be helpful in understanding SEL. Social-emotional learning (SEL) is happening in the U.S., China, the UK, and Singapore! Some of my friends get excited about new technology, some get excited about new fashion trends, others get excited about the latest music…I get excited about social-emotional learning!!! Validated by research, social-emotional learning is shown to enhance academic success as it actually reduces stress levels in that pursuit. It prevents negative behaviors and gives students the “soft skills” they will need to flourish in today’s work environments. It also promotes positive relationships and attitudes about school, and in general. SEL cultivates our self-awareness. Focusing on understanding our emotions, positive and negative, to help us navigate the classroom, workplace, our relationships and the decisions we make in life. Again (if you are a regular here at “My Happy”), positive emotions such as gratitude, tranquility, love and joy expand our hearts and minds which helps us to share and connect with the people in our lives and increase our learning potential. Also, as I have previously mentioned, there are times everyone experiences negative emotions and difficult experiences, however, our children will be better equipped to handle those times with this kind of learning. I have created an SEL page where I have taken information from various sources to explain what SEL is and why it should be a priority in our homes, schools and communities. I also included websites where you can find more information. Take a look at the Social and Emotional Learning Page to learn more about it. I would love to hear about what you think! You can write a comment or e-mail me at tiffanylynne_14@yahoo.com. My family and I practice our EI skills regularly. This is something I encourage you to take time for. Please be sure to do a “self-check” before your try to teach it to your kids or the people in your life. Expecting your children to learn and use these skills only works if you “Lead By Example”. We are role models to everyone around us. Trying to improve and strengthen your emotional intelligence will help your children or the people you are closest to. 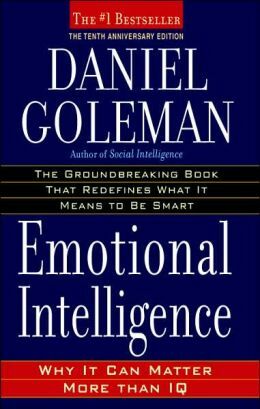 The following is practical information to begin learning and strengthening your Emotional Intelligence. 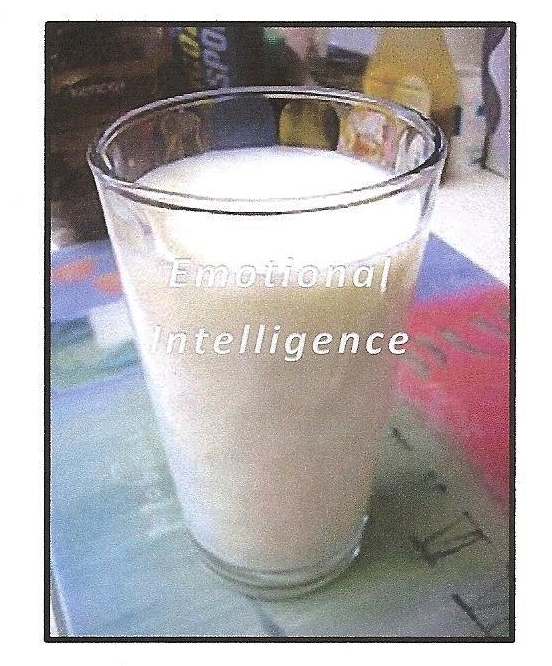 Emotional intelligence is a wide range of skills that children (and adults) can develop and improve. Developing and improving these skills are critical for emotional well-being and life success. Please note, happiness and optimism are at the top of this list. It is my opinion that they should be. If we focus on happiness and optimism we will be strengthening many of the other skills on this list. “My Happy” is full of ideas to strengthen your happiness and optimism. Many of my posts discuss self-awareness. We need to be aware of our thoughts and realize we can control them and choose to be positive. Using positive thinking can improve other skills. Take flexibility for instance. I realized that I have difficulty with this at times. In fact, I can really get annoyed when plans change at the last-minute. My initial reaction was to become upset and react negatively (grumpiness, I know, hard to believe..ha ha). After realizing I did this, I had more control over it. Now when something happens that forces me to be flexible (when I don’t want to) I still may initially react negatively, but I can usually catch myself and change my attitude. 🙂 My improvement happened as a result of practicing positive thinking which contributed to my being a more flexible thinker. Learning and improving these skills is important for everyone. Not only does it improve your social and emotional well-being, it leads to a more successful life. This is a topic that I have wanted to share with others, especially caregivers because I know the value of these skills for children. Not only does it help children do well socially and emotionally, it increases learning potential. As I continued my research in this area, I found CASEL. The Collaborative for Social and Emotional Learning, based at the University of Illinois at Chicago, seeks to enhance children’s success in school and life by promoting evidence-based social, emotional, and academic learning as an essential part of education from preschool through high school. I am looking forward to someday having SEL in schools world-wide. Website: http://www.casel.org or check them out in my twitter feed! What Are You Focusing On In 2015? Focus, or “directed attention” has been life changing for me. When I first read about an exercise to understand the power of our mind’s focus, I did not realize what an impact this would have for me. I was reading about focusing thoughts. The writer asked the reader to think of the color red and notice how suddenly you would see red everywhere. It was a cold winter day and I was reading in the pick up line at my son’s school. I thought to myself, how funny, this won’t work with everything so white with snow. Driving home I noticed a red car, red door, another red car, red lights, and so on. Some of you may laugh and think, well that’s really not that unpredictable. Next, the writer suggests thinking about something bigger. I chose something that I wanted to have to help me exercise, but I didn’t want to spend the money for it. This took longer. I thought about it daily for weeks. One day I happen to find what I wanted and it was free for the taking (used, of course). This got my attention and I decided to keep an open mind as I read more about the importance of our focus. It’s rather simple if you think about it. Focus on positives and you will not only feel better, but you will open your eyes to let in more positives than you saw before. I always thought of myself as making efforts to see the “glass half full” but, what I realized is that it is more than that. It is taking the time to really notice all the wonderful happenings or things around you that fill your world with positivity. If you focus on negatives, you may only see the negative and miss other positives that are happening all around you. Researcher, Richard Wiseman, conducted studies to understand why some people seemed luckier than others. 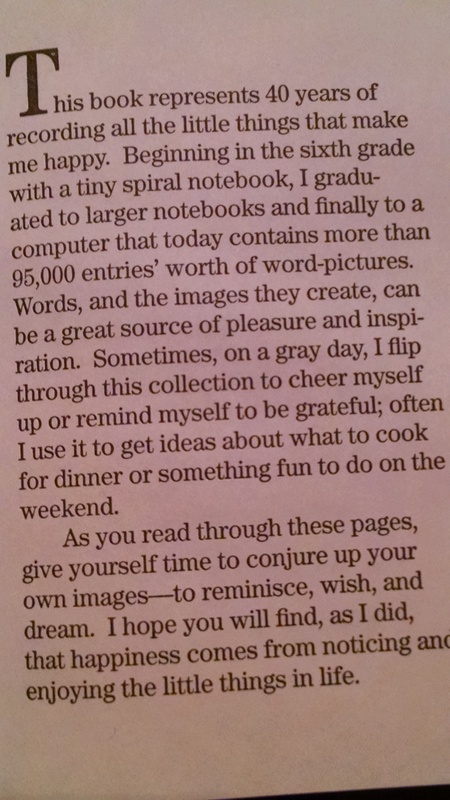 He asked volunteers to read through a newspaper and count how many photos were in it. There were two groups of people: people who claimed to be lucky and people who felt they were unlucky. The lucky people were quicker to know the number of pictures than the unlucky people in this task. On the second page of the paper there was a large message reading “Stop counting, there are 43 photos in this newspaper.” It seems the people who felt unlucky missed the message. The people who felt lucky saw it. This study and others like it show that people who focus on the positives are more optimistic. Optimism leads to being more observant of positive opportunities. People who don’t feel lucky (or who do not seek out positives) may miss out on positive things all around them. “My Happy” is one way for me to stay focused on the positives. What better way to organize information for myself and others to benefit from? 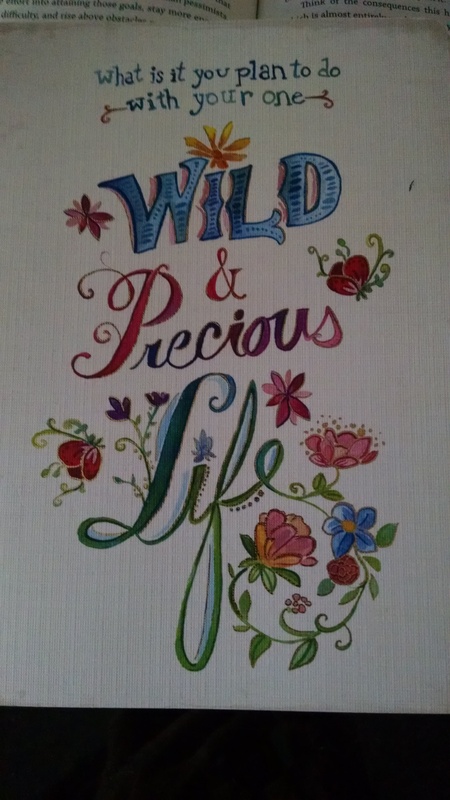 I didn’t realize all the other wonderful things that would come from this happiness blog. I have friends and family who supported me by reading or following this blog. Besides that apparent support, I had many opportunities for wonderful conversations about things I was writing about. I realized my friends and family shared my interests. 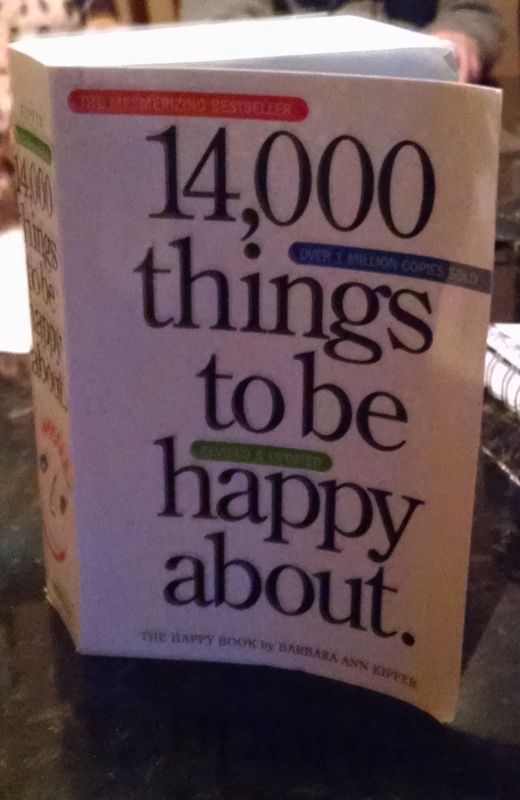 Some examples of focusing on the positives leading to increased positivity for me were: receiving a daily positive quote book, learning about twitter, receiving current information to add to my blog, sharing of a book “14,000 Things to be Happy About”, receiving a journal to help me organize all my ideas. One of my favorite results was when my older son told me he thinks my blog is “cool”! ( If you are a parent, you know how amazing THAT is) Staying focused on the positives and opening up about it has led to these experiences and more for me. These may sound like small things, but aren’t the small daily connections we make so important? My positive friend Lois, who encouraged my idea to blog and guided me to WordPress, led me to a community of bloggers which I have received support and encouragement from. It has also given me the opportunity to learn from their blogs and gain new perspectives from all over the world! I hope you are excited about practicing this simple strategy of directing your attention to the positivity around you, if you don’t already, in 2015! May your focus on positivity lead to more positivity! A very special thank you to Patricia and Dan for staying so positive when my family can be a handful, awesome, but a handful. To my friend Kim for staying positive through a tough situation, you inspire me!